Okay, okay—you caught us. Novelist Jane Austen (1775–1817) never intended for her timeless first line from Pride and Prejudice to be recycled to talk about remodeling, but this tweaked version of her truism works well as advice for choosing flooring for your bathroom. 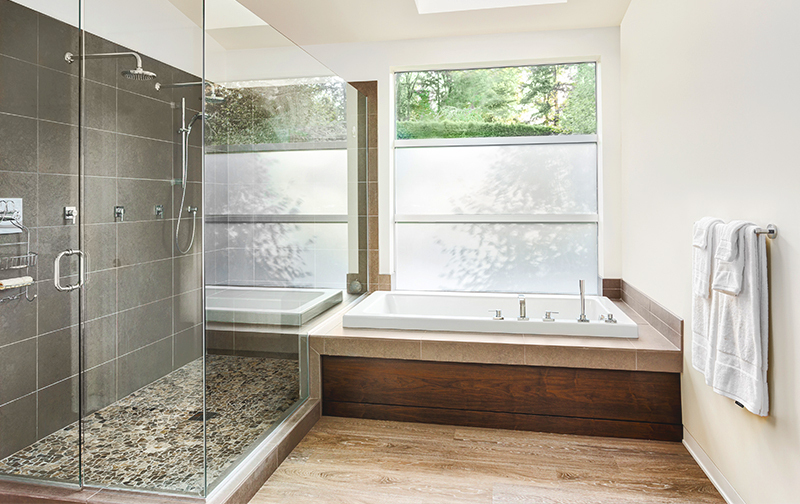 That’s because, when it comes to updating your bathroom floors, it’s all about water and avoiding moisture-related issues, which is why so many homeowners choose a reliable option, like tile. For many people, hardwood is a popular choice throughout their homes because it never goes out of style and creates inviting, beautiful, and warm spaces. It works well in almost every room of a house. Almost. When it comes to bathroom floors, we generally don’t recommend hardwood because wood and water aren’t a good combination. In fact, only carpet is a more controversial choice than hardwood for bathroom floors due to carpeting’s fantastic ability to absorb moisture! If you’ve done some research on hardwood installation in bathrooms, you’ve no doubt stumbled upon blog post after blog post in which the prevailing wisdom among most design consultants is to recommend bathroom flooring options—like tile—because it is moisture resistant (and great at handling humidity). And, while there are great options in tile in the bathroom, what if your feelings will not be repressed and you still want hardwood floors in your bathroom? Realistically, what are your options for getting the solid hardwood look you love in your bathroom? If you decide to go with hardwood floors, you can opt for a design that incorporates a little tile to create a strategic backup plan in case of common water-related problems. Protect potential problem areas (like the parts of your floor near the tub/shower, sinks, and toilet) by incorporating tile surrounds to catch everything from random droplets to minor overflows. Check out these ideas on Houzz to see some examples as inspiration. Though tile surrounds can help, you can’t control the unexpected, like major pipe bursts. No matter how well you plan to take care of your hardwood, accidents like this can happen and ruin your beautiful hardwood floors. Keep in mind that there’s always a chance that water may end up on the floor, dripping down into the seams between planks (and potentially creating damage like warping, staining/discoloration, mold growth, popping nails, and more). New developments in flooring technology make it easier than ever to mimic a hardwood look, even in spaces that aren’t a good fit for the genuine article. Manufacturers’ latest offerings are so good, in fact, that your visitors might not be able to tell your bathroom floors are not hardwood. Today’s luxury vinyl is a hard-wearing and long-lasting type of flooring that’s also easy to take care of and budget-friendly. You can buy it in planks with believable features that make it look like real wood, including beveled edges and detailed texture. It’s also soft underfoot and quieter than tile. Wood-look tile is designed to imitate the grain patterns and feel of wood floors so well that it’s not easy to differentiate it from actual hardwood by eye alone. Tile is also easy to care for and keep clean. Plus, if your flooring gets damaged, you can just replace the tiles affected without having to redo the complete floor. Worried that tile might be too cold underfoot during the winter? Add warmth with underfloor radiant heat. The closest thing to hardwood among these options, laminate wood flooring is popular because the planks come in a variety of realistic colors, textures, and patterns, and it’s water-resistant, durable, and affordable. When you’re looking for the best hardwood flooring for your bathroom, you can’t go wrong with “make believe” wood options that appear nearly indistinguishable from true wood.